24 “But in those days, after that tribulation, the sun will be darkened, and the moon will not give its light, 25 and the stars will be falling from heaven, and the powers in the heavens will be shaken. 26 And then they will see the Son of man coming in clouds with great power and glory. 27 And then he will send out the angels, and gather his elect from the four winds, from the ends of the earth to the ends of heaven. 28 “From the fig tree learn its lesson: as soon as its branch becomes tender and puts forth its leaves, you know that summer is near. 29 So also, when you see these things taking place, you know that he is near, at the very gates. 30 Truly, I say to you, this generation will not pass away before all these things take place. 31 Heaven and earth will pass away, but my words will not pass away. 32 “But of that day or that hour no one knows, not even the angels in heaven, nor the Son, but only the Father. With this Sunday Gospel we conclude readings from Mark’s Gospel. Next Sunday the Gospel is taken from John’s Gospel and the following week is Advent and Year C when the Gospels will be taken from Luke’s Gospel. Jesus is now in Jerusalem. He is sitting, the posture of a teacher (Mk. 13: 3). Those he is instructing are Peter, James, John and Andrew, the core of the Apostles, the first four chosen (Mk. 1: 16–20). The last book in the New Testament is the Book of Revelation or the Apocalypse, the Greek word for ‘revelation’. I mention this only because apocalyptic writing is a distinct form of literature that describes hidden supernatural events that are symbolical and can be interpreted in more than one way. Mark’s Chapter 13 is often called “The Little Apocalypse”. In Chapter 13 there are two apocalyptic scenes, that of the destruction of Jerusalem (Mk. 13: 3–23) and that of the end of the world (Mk. 13: 24–27), the current passage. “But in those days” — This is one of those expressions that is general and does not necessarily refer to a particular time. “after that tribulation” — The Old Testament refers to a Great Tribulation (Is. 13: 10; Dn. 12: 1; Ex. 10: 14; 11: 6; Jer. 30: 7; I Mc 9: 27). The days of tribulation are mentioned in Mk. 13: 13 and 17 and twice in verse 20. Verse 19 says that this tribulation will be the greatest since the creation of the world. Recall what was said about the style of apocalyptic writings in the Introduction. “the sun will be darkened, and the moon will not give its light, and the stars will be falling from heaven, and the powers in the heavens will be shaken” — Note that these signs will take place “after that tribulation”. This is an excellent example of classical apocalyptic language. The reference to “sun”, “moon”, “stars” and “powers in heaven” refers to all creation which is pointing to something greater coming. The old creation will come to an end; it will be the end of the world. It will not be a chaos as before the first creation. It will be a new existence in the presence of the glorious manifestation of God. “And then they will see the Son of man” — From the description of the “Son of Man” throughout Mark’s Gospel it is clear that the reference is to Jesus (Mk. 2: 10, 28; 8: 31, 38; 9: 9, 12, 31; 10: 33, 45; 13: 26; 14: 21, 41, 62). “coming in clouds” — “Clouds” are a symbol of God’s presence (I Kg. 8: 10–11; Mk. 14: 62). “with great power and glory” — These words refer to God’s power and glory which Jesus will have. His divinity will not be hidden as when on earth. This is a great sign of hope for the future to the readers of Mark. “And then he will send out the angels, and gather his elect” — At his appearing, the Son of man will be in charge. He will gather, by his angels, his scattered people as God described his gathering of the people in the Old Testament (Dt. 30:4; Is. 11: 11, 16; 27: 12; Ez. 39: 27). Jesus will be the focal point of the future gathering of “his elect”, his community, the perfected kingdom of God. “from the four winds” refers to the four points of the compass: north, south, east and west. “from the ends of the earth to the ends of heaven” — This refers to all creation. Mark does not mention a Last Judgement. His intention was to fill the Christians undergoing persecution with hope. The persecution began in 50 A.D., was intensified after the fire in 68 A.D. and then came the destruction of the Temple in 70 A.D. Peter and Paul were executed as were countless others. “From the fig tree learn its lesson:” — The word for “lesson” here is the word “parable”. This parable teaches that we can learn the signs of the times from nature itself. “So also, when you see these things taking place, you know that he is near, at the very gates” — When we see nature coming apart we will know that the Son of Man is coming, is “near”, indeed is imminent — “at the gates”. “Truly, I say to you” — Another example of a regular introduction to a very important statement. 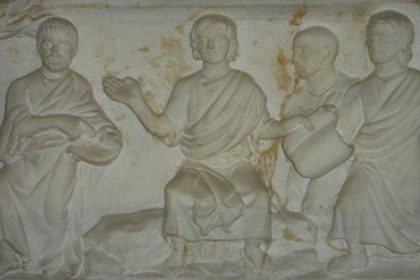 Jesus is speaking to Peter, James, John and Andrew (Mk. 13: 3). “this generation” — This refers to the contemporaries of Jesus (Mk. 8: 12, 38; 9: 19). “will not pass away before all these things take place” — These four apostles and their contemporaries will witness “all these things”. “These things” refer to the destruction of Jerusalem and the Temple in 70 A.D.
“Heaven and earth will pass away, but my words will not pass away” — Nothing whatsoever is more stable and secure than the word of Jesus. “But of that day or that hour no one knows, not even the angels in heaven, nor the Son, but only the Father” — Verse 30 referred to the destruction of Jerusalem. Verse 32 refers to the end of the world. This is a call to vigilance by all who hear or read these words. “that day” — This is a term widely used in the Bible to describe the day of the Lord’s appearance (Amos 8: 3, 9, 13; 9:11; Mic.4: 6; 5: 9; 7: 11; Zeph. 1: 9+; 3: 11, 16; Ob. 8; Joel.3: 18; Zech. 9: 16, 12–14). If the Son and the angels do not know, who are we to even want to know! There are certain things about which we should not even question God and this knowledge is obviously one of them. (See vv. 33 & 35: you do not know). 1. Chapter 13 of Mark’s gospel is a long instruction Jesus gave to the four core apostles, Peter, James, John and Andrew. They had admired the Temple in Jerusalem and Jesus told them that it would be utterly destroyed. They asked two questions: When would that be? What sign would there be of its destruction? Jesus answered their questions and went further, speaking about the end of the world. This is the current passage. 2. Jesus knew that when the Temple would be destroyed in 70 A.D. the Church would be under persecution and many would be confused at this first call to martyrdom. That is why he went further than their questions and decided to fill the disciples with hope to carry them through their persecutions. He foretold the coming of the Son of Man, Jesus himself, in the clouds with great power and divine glory. A new world would begin. That is the great Good News and all the tribulations mentioned are to be seen in that light. The whole universe, sun, moon, stars, powers of heaven, the four corners of the earth and the heavens will bow before the coming of the Son of man. The destruction of the world is not meant to terrify people. Jesus adds more words of consolation. His angels will be with him in his glorious coming. He will send them throughout the universe to gather his elect and bring them together into one happy family, sharing the eternal life of the heavenly realm. Mark does not describe Jesus coming as a judge but as a Saviour. He is coming for his “elect”. This is Good News. 3. Jesus words are true, reliable and lasting. Nothing can destroy them. He offers us a teaching of hope, describing for us what is in store for us if we but listen to his words. Unfortunately there are people who do not understand his words or rely on them. They have their own agenda and interpret his words to suit that. They gather people around them and promise to impart knowledge of the end of the world. In my life–time there have been dozens of these. Their predictions were false; the world is still in existence. We should not be afraid or terrorised by signs of the destruction of the world. Our reaction should be one of joy, knowing that Jesus is coming to bring us into his realm, his purpose in coming as our Saviour 2,000 years ago. 4. In the meantime we wait in patient hope and joyful expectation. From the fig tree we learn not to be pre–occupied with time but with watchfulness. In this passage, Jesus is in Jerusalem waiting for his crucifixion. He instructs his four apostles to be watchful, to live in hope no matter how dreadful the imminent signs of his passion and death may be for them. His words and promises should fill us with joyful hope as we wait for his Second Coming to gather us to himself.